Complete meals from kitchen to table in no time at all The book has 60 brand new complete meal ideas that will allow you to cook a proper meal quickly and simply with Jamie's step-by-step timetable In his new book, Jamie's 30-Minute Meals, Jamie proves that, by mastering a few tricks and being organized and focused in the kitchen, it is absolutely possible, and easy, to get a complete meal on the table in the same amount of time you'd normally spend making one dish! The 50 brand-new meal ideas in this book are exciting, varied and seasonal. They include main course recipes with side dishes as well as puddings and drinks, and are all meals you'll be proud to serve your family and friends. 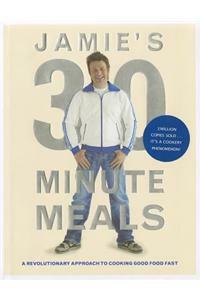 Jamie has written the recipes in a way that will help you make the most of every single minute in the kitchen. This book is as practical as it is beautiful, showing that with a bit of preparation, the right equipment and some organization, hearty, delicious, quick meals are less than half an hour away. You'll be amazed by what you're able to achieve.